Our Progressives have taken the masks off – their efforts to subvert the Electoral College have stopped being pitched as a good government proposal and are becoming a naked attempt to bully GOP Electors in to voting Hillary. It won’t work. But it does show that the left is scared – very, very scared. They’ve spent 8 years weaponizing the government and now fear they are to be on the receiving end of what they’ve dished out. Fear not, my Progressive friends – we won’t pay you out in your own coin. The laws, though, will be enforced…now, if none of you have maintained a massive slush fund based upon donations from shady characters, you’re probably in the clear. As an aside, Jeh Johnson says there’s no evidence of hacking the voting or the counting…of course, we all knew that. What Democrats have been trying to do is confuse the issue of the hacking of the DNC (which did happen) in the public mind with hacking the vote (which didn’t happen) in an effort to get people to think that Putin hacked into Michigan’s vote and changed the result from D to R.
So, the Muslim student who claimed Trumpsters tore off her hijab was making it up. Have any of these things ever proven true? You can put it in the comments if we had one – but over the past 10 years, I can’t think of one such incident where investigation verified it…but plenty where investigation proved it false. Anyways, our Progressives are never at a loss – they are now claiming she made it up because of her fear that things like that will happen because Trump. A lot of people are giving Obama grief over Aleppo – let me be one to not give him grief. Folks, the only way we were going to stop it from happening was to send an army over there and fight pretty much everyone in the area. Did you want to do that? Did you call for that to be done? Now, a policy can be constructed which justifies just such an action – back in the olden days when we had a spine, we called such actions a “punitive expedition”. But, we don’t do that sort of thing any more. And unless we’re willing to spill very large buckets of blood in the effort, there’s nothing much we can do to actually stop the fighting. To be sure, Obama appears to have stepped aside because his buddies in Tehran insisted rather than out of some humanitarian impulse…but I’m not going to condemn the man for not doing what none of us wanted done. Chris Connors died, at age 67, after trying to box his bikini-clad hospice nurse just moments earlier. Ladies man, game slayer, and outlaw Connors told his last inappropriate joke on Friday, December 9, 2016, that which cannot be printed here. Anyone else fighting ALS and stage 4 pancreatic cancer would have gone quietly into the night, but Connors was stark naked drinking Veuve in a house full of friends and family as Al Green played from the speakers. Under Capitalism, the rich get powerful – under Socialism, the powerful get rich. Four richest counties in USA are suburbs of DC. Sylvester Stallone as head of the National Endowment for the Arts? Artbo: First Painting, Part II. The #NeverTrumpers did not wish to talk about that question, preferring to preen about perfect Platonic Ideals and how much better they were than everyone else. I’ll say it: I want them gone. They say we’ve revealed our stripes; fine, I’ll say they’ve revealed their own. Go. Get gone, be gone, and stay gone. Join the liberals, which 90% of you are already 90% of the way along to doing. Just make it official, so we don’t have another crop of fake conservatives appearing in the liberal media for the only purpose of collecting a check while bashing other conservatives — the ones who are actually looking out for this country’s future, rather than their own reputability and acceptability to their would-be liberal media employers. Yeah, I’m on board with those sentiments. It was a binary choice – we had a choice in November between Hillary being President and Trump being President. I think I made it clear through the election that I had grave doubts about Trump. I still do – a bit pleased with some of his actions so far, but the jury is still very much out. But Hillary was, is and always will be the worse choice. Period. We’ll know in 3 days if the Left’s efforts to subvert the Electoral College are successful. My guess is that it won’t be, if for no other reason than I think the majority of electors probably realize the disastrous ramifications if they don’t proceed as expected. I don’t think even the most rabid Leftists want to set off another civil war, although, knowing the Left, there may be quite a few that just really havn’t thought through the consequences of what they’re doing. Any guesses on whether there’ll be any Electoral defectors? If there was. I wonder what kind of blow back they’d receive? JDG1, see my post above. There will be one on Trump’s side, unknown how many on Hillary’s…Trump’s faithless elector has some rather large question marks about his biography and that shows a definite need to tighten up the rules for selecting Electors. But Trump will get at least 305 Electoral Votes on Monday. It’s a done deal – except for the one nitwit in Texas, the Electors are party stalwarts who wouldn’t dream of doing other than what the voters of their States decreed. Out of curiosity, what do you mean by “subvert”? 3.) There’s no way slave states were going to sign on to a direct vote because they would have a tiny amount of influence, so they needed to find a way to apportion presidential selection roughly along the lines of the 3/5ths compromise plus the Connecticut compromise. 3 is really my favorite, because whenever people start talking about how the electoral college was designed to protect the rights of more rural states, they always get into talking about how most of the landmass of the country is would be under-represented without it. The framers weren’t worried about making sure that fields and trees got represented when they apportioned electors, they were working out how much extra influence people got for owning other people. But more importantly, electors deciding to vote for Hillary Clinton doesn’t obviously subvert any of that reasoning, and it seems to be at least as close as you can get to the modern spirit of reason #2. The clear intent of the Constitution was to allow states to determine how electors were selected, not dictate how they vote. That’s why faithless electors can even be a thing, really. States can fine or punish electors all they want, but their votes will still count. Now, I realize that none of this amounts to any real chance that Trump isn’t going to be the next President, but let’s not pretend that it’s because the system is working as intended. Definition of subvert. 1 : to overturn or overthrow from the foundation : ruin. 2 : to pervert or corrupt by an undermining of morals, allegiance, or faith. I see you are back again, Try, squirming under the tent to see if we will tolerate you any more this time than we have in the past. I personally often find your posts to be of great value, illustrating as they do the incredibly twisted thought processes of people who are often, as you are, otherwise apparently pretty smart. The post above is a great example. In this statement of your inherent bigotry and disdain for the Founders and the rule of law they established, you also manage to insert a snotty snobby Leftist sneer in which you reduce the people of the more rural areas as having no more value than “fields and trees”. This is completely consistent with Leftist arrogance and worship of superficial characteristics such as names of schools and residence in urban areas. In recent years, California has been turning into what amounts to a one-party state. Between 2008 and 2016, the number of Californian’s (sic) who registered as Democrats climbed by 1.1 million, while the number of registered Republicans dropped by almost 400,000. And just to emphasize this, while further destroying the whole Lefty whine of (Must imagine this shrieked in makes-your-ears-bleed squeals of outrage) BUT HILLARY WON THE ELECTION !!!!!!!!! (3) You believe that once the Left has taken control of a large and heavily populated state that state’s votes should be allowed to override the votes of the people in the rest of the country. You ARE a good little Lefty, aren’t you? Try, everything you say is true except for Hamilton being pissed off and proposing the 12th Amendment. It’s suggested in your article that some of the handwriting in the original draft of the 12th Amendment was Hamilton’s, but if he was “pissed off” at anything it was the fact that the original wording of the Constitution allowed for the President and Vice President to come from different parties as happened when Jefferson became John Adams’ VP in 1796. The 12th Amendment rectified that. Federalist No. 68 is the continuation of Hamilton’s analysis of the presidency, in this case concerned with the method of electing the President. Hamilton argues the advantages of the indirect electoral process described in Article II Section 1 of the Constitution although, in the case of an Electoral College tie, the House of Representatives was to make the choice. And to say that Madison was “pissed off” is also somewhat of an overstatement. Here is a pretty comprehensive, non-partisan piece on the evolution of the Electoral College. The fact remains that the Founders didn’t subscribe to the Electoral College system as we know it today. It’s something that evolved over the first half century of the history of our Republic. Now that’s not to say that it shouldn’t or won’t be changed, but it’s a system that’s served us well for 180 years, and the fact that slavery had anything to do with its original adoption is as irrelevant as slavery being a present day component of ANY political argument. The Electoral College also acts as a safeguard against the kind of massive vote fraud that the Democrat Party has become so adept at, and which manifested itself so visibly in this election, since the lion’s share of such fraud occurs in states where Democrat dominated large metro areas compose the majority of the state’s population, and the electoral vote is almost certain to go to the Democrat candidate anyway. The NPVIC is a proposed agreement among the states and the District of Columbia to render the Electoral College obsolete by ensuring that the winner of the popular vote also wins a majority of electoral votes. Here’s how it works: States are constitutionally empowered to decide how they assign electors. If a state passes the NPVIC, it vows to assign its electors to whichever candidate wins the national popular vote—but only once enough states have joined the NPVIC to guarantee that candidate 270 electoral votes. Ten states and D.C. have already joined the compact, adding up to a combined 165 electoral votes—or 61.1 percent of the votes necessary for the compact to take effect. If a few more states join, their combined electoral votes will reach 270, and the compact will take legal force. (how democratic!) At that point, the Electoral College will become a footnote. The winner of the popular vote will instantly be awarded the necessary electoral votes to become president under the Constitution. States that refused to join the compact can do nothing to stop it. I would note that that last sentence is not entirely accurate. Before the Left institutes such a change they will have to repeal the Second Amemdment. Spook, the article by Mark Joseph Stern you cited is an absolute gold mine of sheer genius. It takes a level of genius to pack so much wrongness into such a short paragraph. I will highlight the errors, though it is not possible to highlight the cumulative effect of so many errors piled upon each other. The Electoral College is a democratically indefensible anachronism that dilutes minority votes while disproportionately amplifying whites votes. Defenses of the system are almost comically casuistic in light of the fact that we transcended its two original purposes: To water down democracy by choosing independent “electors” who vote for president (which we no longer do), and to help Southern states maintain national influence despite the fact that a large chunk of their population consisted of slaves who were denied the right to vote. But the Electoral College remains lodged in our Constitution, and this year, for the fourth time in history, it elevated to the presidency a candidate who lost the popular vote. Actually, after I pasted the above paragraph into my post I realized that highlighting its errors would basically mean highlighting the entire quote. The Electoral College is not an anachronism, nor is it indefensible. It is easily defensible. It does nothing to “dilute minority votes”. It has nothing at all to do with “… disproportionately amplifying whites (sic) votes..” though this is a new meme of the Loony Left, a frantic effort to link the Electoral College with its new favorite weapon, RACISM. We have never “…transcended its two original purposes..” and the article’s subsequent “explanation” of these two alleged “original purposes” is laughable. He does illustrate his rather impressive ignorance of the structure of the nation, though. We are not a democracy. Never have been, never should be, and the Founders argued vehemently against ever allowing us to become a democracy. We are a republic, with our laws made by our representatives. So the silly whine that the Electoral College “..water(s) down democracy..” is just that—whiny and silly. And the sad pathetic belief that the EC was designed to somehow support slavery—-a strange fantasy evidently shared by Travasty—is baseless except in the murk of the fever swamp mentality of the rabid Left, and its desperate effort to link its success in manipulating millions by its employment of the idea of racism to moving the nation from its current status of a republic to one of mob rule. AKA “democracy”. As for the beloved “…elevated to the presidency a candidate who lost the popular vote…” whimper, I have covered that in an earlier post. This beloved “popular vote” margin depended entirely on the votes in one state, and there is evidence that it was also supported by as many as two million votes from illegal sources. I issue a challenge to the Lefties who really really really want a popular vote to choose our president. Go along with purging our voter registration rolls, nationwide, of dead registrants, illegal registrants, and multiple registrants, and then protect the vote with legislation requiring every voter to show a state-issued voter ID to prove that he or she is actually the person on the voter registration rolls. When the Left is as interested in making our voting process as legitimate as possible, they can then make their argument. Till then,they are just annoying voices in the wind. Voices which, by the way, are silent when a Republican gets the popular vote, but that’s another story for another time. I would note that that last sentence is not entirely accurate. Before the Left institutes such a change they will have to repeal the Second Amendment. Spook, that is a wonderful response. The part you highlighted is a statement of fact. A lot of the Founders owned slaves. There would have been no Union without the Three Fifths Compromise, the Connecticut Compromise, and Presidential apportionment along the same lines as the Electoral College. None of that had anything to do at all with anything except Slavery. The fact that you take an accurate description of our history as “disdain for the Founders” speaks more to your hatred of the who the Founders really were than any it does of any value judgement I’ve made. I said no such thing. I value the people just fine. I just don’t think anybody during the Constitutional Convention was worried about apportioning influence by geographic area, or giving rural voters additional influence, because 90% of the country’s population at that point was rural. Trying to make anything they did about rural vs. urban is actual reverse-engineering. The unequal representation in the Electoral College was about slavery. In true Amazona fashion, you move on to arguing with some random people you are quoting off the internet and not me. I’m actually curious whether you think this is a good debate tactic, or if you have some consistent delusion that the only way somebody could disagree with your obviously infallible logic is because they are a brainwashed drone incapable of formulating their own opinions. I suspect the former, because it’s an easy shorthand that you think lets you argue with people about points they didn’t even make, but I can’t rule out the latter. Either way, you should know it isn’t compelling reading. Especially when the next reply after you, from somebody who very clearly is not a “Lefty”, is that everything I said was true except for one point. The initial draft spent a long time specifically laying a district-by-district approach to selecting electors. He clearly didn’t like either thing that was happening. Federalist 68 is all about the virtues of choosing informed electors to deliberate and make an independent decision about whom to select as President. He clearly like the idea of the Electoral College, just not the version we shuffled into where states bloc vote for the winner of a general, direct ballot. He describes the article setting up the election and apportionment of electors as a “faulty part of the Constitution”. I agree that it is no longer relevant. It only really matters when people want to argue about original intent, which you seem less concerned about. In general, I’d think a popular vote would be more resilient to voter fraud, because the scale required would be much larger. Voter fraud on the scale of a few hundred votes in Florida could have decided the outcome of the entire 2000 election. The electoral college provides leverage to potential fraud by providing leverage points where a small number of votes can generate a large swing in the overall outcome. That’s true, but people in power not being willing to give up their power isn’t usually a good argument for the correctness of a system. Somebody proposing that Cuba reform how it selects a President would probably get a lot less traction than somebody proposing an amendment to abolish the electoral college. Their proposal no more bypasses the Constitution than all electors voting winner-take-all. But the system is working as intended. It’s working as it has for quite some time and most important of all, it’s working precisely the way every single American expected it to work before they cast their ballots. That’s kind of important. Try, are you sure you are actually quoting Madison? I’ve read a lot of Madison quotes and the language you used seems a little modern for Madison. Got a link? What you are saying is that, even after the compromises you stated, most states (not just slave states) would have fewer votes than heavily populated states and therefore less say in the electoral process. This is something that not only existed at the time the Constitution was signed, it was anticipated as a future distribution of population as more states were added. “The goal wasn’t to support slavery, it was to get slave states to support the Constitution…. “ OR “”The goal wasn’t to support slavery, it was to get states with smaller populations to support the Constitution…. ” and BTW some of these states were also states that allowed slavery. As you can see, it is your choice to focus on the fact that slave states were included in that number of smaller-population states and from that point make the assumption that the Electoral College was INTENDED to head off only slave-state opposition. A popular vote deciding the presidency is actually democracy in action, which was an outcome feared and avoided if at all possible by Madison. ….A republic, by which I mean a government in which the scheme of representation takes place, opens a different prospect, and promises the cure for which we are seeking. If you are just looking for something to quibble about and snarl about and carp about, and have decided you can find this in the term “subverts” then go for it, wallow in it, and preen over it. Hooray for you. What we conservatives find so funny it that it took the bastardization of Hamilton and cherry-picking of his philosophies by a bunch of Liberals to suddenly make his opinions, or what you think were his opinions, sacrosanct to you guys. Personally, I have never been a big Hamilton fan, and wondered about his friendship with Madison because of their major differences in political theory. For example, Hamilton was all about a federal bank, which put him at odds with a lot of the Founders. As I wrote this, I realized why you guys are so bumfuddled. You are sheep, swallowing and regurgitating what you are fed, and are basically one big organism—-today’s Borg. You are baffled by the existence of a demographic in which individuals are just that—individuals—-who sometimes agree with each other, sometimes disagree, but are united in basic concepts of governance. To you, if Hamilton had some OPINIONS and was one of the Founders, then we should accept his individual opinions as somehow reflective of the entire foundational philosophy of the country. Hamilton made some jogs and detours in his political philosophy over the years, and many of the Founders disagreed with some of them. It happens—with people who think for themselves. For people on the Left—not so much. No they don’t. I have never heard anyone talk about how any “landmass” might be underrepresented. People, yes. Living, breathing, working, citizens of this country. You claim to be against slavery, yet you seem perfectly happy at the idea that the people who live in this amorphous “landmass” of “fields and trees”—where, by happenstance, most of the food and raw materials that support the highly populated urban areas originates, grown or made or mined by those people—should not have the same ability to make their choices known. To have these people disenfranchised, which is what a popular vote would do, would be to return them to the “taxation without representation” issue that has already prompted one armed rebellion against tyranny, and which could be described as involuntary servitude. Either that or you just lurk, lying in wait for a single phrase or word you can pounce on to bicker over and try to shred, so you can posture as a political pundit or intellectual or whatever your personal fantasy dictates. And now, suddenly, this is about “voter fraud”? And you sniped at me for allegedly changing the subject, from one approach of the electoral process to another. Trump made a good point—if the popular vote was all that mattered, he would have campaigned more in states like California and New York. How much time do you think he would have spent talking about his plans and policies in Wyoming? Nevada? North Dakota? Nebraska? You know, out in that big “landmass” of “fields and trees”? How many candidates would expend energy and resources to lightly populated states? Move the entire electoral outcome to a handful of heavily populated states and you have tyranny as well as more opportunity for voter fraud. Corruption goes where the power is. If the power is in a handful of heavily populated states, that is where you will find corruption. You are so shameless in your lying, and so full of crap. All you can do is find out what your Leftist minders tell you and then come here to spew it, in an effort to distort everything they stood for, whereas I have actually read the actual words of the Founders, and of their contemporaries, and have spent the last couple of decades talking about their wisdom and foresight, while you and your kind have tried to undermine everything they did and tried to do. Do you really think you are fooling anyone? Do you really think you can convince anyone you have the slightest respect for anything the Founders stood for, fought for, and in some cases died for? If so, you are even more delusional than you appear on the surface—-and that is saying something. To see you piously pretending any respect for any of them or for any of their goals and beliefs now is disgusting. It’s like you people trying to quote Scripture to make a point, when you have only contempt for religion and people of faith. You people really are despicable. Its been well answered by others, but I’ll add my two cents: subvert in the sense that the Electors are not free agents. They are political ciphers who have the ceremonial job of ratifying officially the decision decreed by the voters on a State-by-State basis. It has been pointed out by others that the Electors used to be free agents – but that got changed when the free agents were suborned to merely continue in power a Ruling Class which had lost the support of the people. State by State in the aftermath of the 1824 election (where Jackson was denied a victory which should have been his by Electors acting as free agents in opposition to the will of the people) changed their laws to ensure that the Electors would just ratify the popular vote in the State. This is not to say that this is a perfect or even the best system – it is, however, the system we’ve got. If anyone wants to change it, it would have to be on a State-by-State legislative basis (the Constitution empowers the State to determine the manner in which Electors are chosen) or via Constitutional amendment to alter or abolish the Electoral College. These post-facto efforts to change the election outcomes by getting the Electors to act against their purpose are subversive – un-American to the core. So one option is to Amend the Constitution while the other option is to nullify a provision of the Constitution WITHOUT amending it, ie., bypassing the Constitution. The problem with messing with the Constitution in such a way is that the dynamics of the population might change at some point in the future. I probably won’t live to see it, but California and New York could turn red at some point, and then you can bet that Democrats will want to undo what they’ve done. It’s the same thing as the Nuclear Option in the Senate that Harry Reid initiated on all confirmations except SC justices. I’m not sure if he was so arrogant that he thought Republicans would never again control the Senate, or if he’s just that stupid — probably a bit of both, but it eliminates the possibility of a Democrat filibuster on all of Trump’s appointments except SC justices. Always wondered about that National Popular Vote pact…it is bound to only be passed by liberal States…and, so, all it will do is simply confirm what we’ve already got. Unless they can get some deep red States to go along, it is just a bit of political posturing…and, you watch, if enough blue States get it done and a Dem wins the EC but loses the popular vote, they’ll drop that idea like a bad habit. Because among the many marks of Progressivism, hypocrisy is right up there. The electors are charged with casting a vote for the candidate that won the popular vote of their respective states, period. They are not charged to second guess that popular vote, nor are they charged to subjectively impose their opinion as to whom they deem the more qualified candidate. Their duties are clear and any elector who defects from that duty is subverting the constitution. It makes no sense to glorify the national popular vote while at the same time working to subvert the popular vote of each state. Of course this is who Democrats are, and I have grown so tired of their smugness, arrogance, moral preening, and incompetence that physical violence towards them needs to be left on the table. In 2008, Michelle Obama stated that for the first time in her life she was proud of her country and now following Trumps election, she said that the country is entering a time of hopelessness. That is all you need to know about that repugnant woman. At his end of the year “very bizarre” press conference, Obama mentioned his talk with Putin about cyber hacking earlier in the year and he said that he told Putin to “knock it off”. I wonder if that was followed up with a sternly worded letter and a hashtag campaign. 34 days folks before he leaves. I wonder if he used his Mad Daddy scowl when he allegedly “warned” Putin. … from the people most likely to be in support of the Electoral College. I’d personally like to thank Tryvasty for stopping by and prompting me to do a little research into aspects of our history that I haven’t looked at in quite a while. The difference between us is that we look at America through completely different lenses. He sees Founders who were nothing more than racist old white guys, and I see some of the most intelligent visionaries who ever inhabited the earth, who were conflicted by the fact that some of them owned slaves, and there was nothing they could do about it at the time and still form the greatest nation the world has ever seen. They did not let the perfect be the enemy of the good, and we are the beneficiaries of that wisdom. I and millions like me am more than willing to lay down our lives to defend the concept of a representative republic and the greatest experiment in self governance the world has ever seen. I wonder if Try is willing to lay down his life to further the cause of transforming America into a social democracy or if he’s only willing to support people who will dismantle it a piece at a time. On a related note, it’s precious how the left is clinging to the sense of moral victory over Hillary’s apparent win of the popular vote. Leaving aside the question off illegals voting and fraud in places like Detroit, they’re literally bragging about winning a game that wasn’t even played. Trump brilliantly strategized to win the contest being waged and left the scraps, California and the popular vote, to Clinton. It’s like a losing football team bragging about winning the pre game coin toss. I think you’re all being too hard on Tryvasty. I see him as a principled actor and a kid of high integrity. I would tend to agree. He certainly made me re-evaluate what I thought to be the truth. The problem with studying history is that, unless you only rely on original writings of the people in question, you are stuck with trying to determine which historian is telling the truth — or if any of them are. And even two or more people who actually lived a period or event in history are likely to remember it differently. I have to assume that you guys, Rusty and Spook, are being sarcastic when you praise Tryvasty as “..as a principled actor and a kid of high integrity…” Or you know him outside this blog. My own experience has not shown the slightest hint of principle or integrity. What I have seen is someone who has proven, at least to me, that he has never once come to this blog with an honest desire to have an honest dialogue, but instead has posed as someone who does only long enough to get some of us engaged before dropping the disguise and showing his true ugly colors. It takes less and less time each time we let him back in for this to emerge—this time it was one day, from 2:45 a.m. till 2:28 p.m.
From someone new I might be less skeptical of the true motives of someone who bases his discussion of the Electoral College on some repeated reference to “slave states”, dragging in the 3/5 Compromise. I might think “this could be a sincere and well meaning person who has just been fed a line of bull and we can talk to him about the ugly spin his sources have put on something that is really quite innocuous”. With this person, Tryvasty, not so much, because this person has a history of doing anything he can to twist events and comments in a way intended to defame the Right. He always uses the latest Leftist memes, he always has the most malignant interpretation of any event, and he always quickly reverts to just plain nastiness. I try, sometimes, to separate what seems to be a sincere belief, though I might think it is wrong, from a purposeful effort to just plain lie, and it’s not only not easy, it may not even be worth the effort because there might not be two different foundations for what he says. I have come to the belief that he has no real core beliefs, other than taking pleasure in attacking, maligning, and savaging an invented Other. I know—WE know—that the whole general concept of slavery is very important to the Left. This is why they work so hard to keep its memory alive, to convince one of their biggest demographics that it is a fond memory of Republicans, etc. 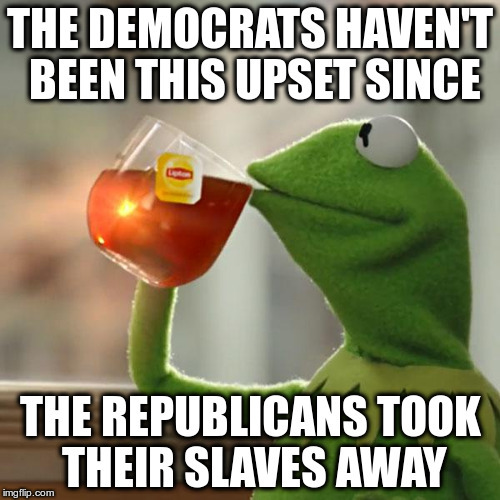 Without the constant claims of racism and constant efforts to link slavery to a party which history (ignored or rewritten by the Left) actually proves to be the party responsible for its elimination, they would lose some of their grasp on power. The Left cannot prevail on the grounds of reason or fact, so it has to focus on ways to stir up and feed fear, hatred and resentment. There is no other reason for the bizarre effort to portray the establishment of the Electoral College as related to slavery. Today the goal of the Left is to de-legitimize the presidency of Donald Trump and to keep negative emotions as stirred up as possible. The Left can only flourish in an atmosphere of chaos, fear, anger, distrust, hatred and resentment, and all we have seen since midnight on November 8 has been the frantic nonstop effort of the Left to create exactly this environment. Donald Trump will be named as the next president of the Electoral College, so the Electoral College must be defamed, smeared, and its own legitimacy challenged—–so they go to their bag of tricks and drag out slavery, and try to link slavery to the Electoral College. Some extremely stupid people may buy this. Try is not stupid, so I don’t think he believes it for a minute. No thinking person could. But he states it, he argues it, he defends the idea, and he resorts to personal attacks and general viciousness in the process. I actually was being sarcastic. Tryvasty doesn’t get under my skin much though. I didn’t read what compelled the moderators to boot him. He certainly engages in trollish behavior sometimes and I really agree with your assessment that he strives for the “most malignant interpretation of any event” in support of leftist dogma, but he makes a good point occasionally. I think alternative viewpoints can add a lot to this blog but as I said, I didn’t read the comments that the moderators thought were over the line. I actually wasn’t being sarcastic. I thought Try carried on a civil conversation. In the past he’s done the things Amazona noted, but not much in this thread, other than the snarky comment for which he was chastised by the moderator. And it’s not as though none of us has ever engaged in a little snark. “I agree that it is no longer relevant. It only really matters when people want to argue about original intent, which you seem less concerned about.” As someone who argues original intent frequently, I’d have to say he has a point. One of the best discussions we ever had on this blog was several years back when we debated (argued) about the meaning of “natural born citizen.” There were several hundred comments, many of them very passionate and many with which I vehemently disagreed, but it forced me to do a lot of research, which in and of itself was extremely interesting, and I actually altered my views a bit after that thread. Spook, perhaps if you had been the one he claimed “hates the real Founders” because of his personal, malignant, take on them, you might have found some nastiness in that as well. It seemed to me that the trajectory of his comments was pretty clear, in this case starting with a personal attack in response to having a malignant interpretation challenged, and I was happy to see it interrupted before it got to its inevitable level of more insults and general hate-filled Leftist rhetoric. I always hope that when he crawls back onto the blog he has learned that to stay here he will have to maintain a level of courtesy and respect, and show a sincere desire to exchange ideas, and I always learn that these are not elements of his personality, but merely superficial tools he briefly uses to ingratiate himself before he discards them for the real agenda behind his reappearance. You said: ““I agree that it is no longer relevant. It only really matters when people want to argue about original intent, which you seem less concerned about.” As someone who argues original intent frequently, I’d have to say he has a point.” I suggest that he has a point only if you agree that the original intent factored in slavery itself as part of its reasoning, and created the Electoral College not just to give all states a voice, but to give an advantage to states that have slaves. He said this. He asserted that the Founders were not really trying to solve the problem of representation for smaller states, they were working out how much extra influence people got for owning other people. This IS his view of the Founders and their efforts to create a workable election process. Try’s pathology, his dark and dismal determination to find (or invent) a nefarious motive for the actions of our Founders, is unpleasant enough, but when he uses his bigotry as justification for attacking others he creates his own consequences. I also argue original intent a lot, and I have never found a bias toward slavery part of that intent of the Founders. On the contrary, I have found many quotes in which various Founders stated their contempt for the practice and their sorrow that, in that time, in that place, slavery would have to be part of the new nation. Try’s not stupid, and he might even truly want to engage in political discourse but is just crippled by the depth and power of his bigotry. As I said, I’ve often given him the benefit of the doubt and tried to engage him in civil discussions of various things. And so far at least, every single time he has ended up indicating that he never had a sincere desire to participate in our discussions, but instead wormed his way into our discussions so he could attack our ideas, and us. He showed us this again. When his conviction that, as he himself put it, they were working out how much extra influence people got for owning other people was challenged, and I thought challenged in a reasonable manner, his default snap-to reaction was to (1) say this proves I hate the “real”Founders (those he chooses to believe in) , and (2) say that slave owners (and one might assume those who support the idea of slavery) are those “..most likely to be in support of the Electoral College”. SUPPORT, not create. Therefore, those of us who think it is an important aspect of our electoral process only do so because we like slavery. Personally, I don’t see any of this as part of a “civil conversation”. Or mere “snark”. And I speak as one who is not averse to snark. Try definitely has a leftward bias in his thinking, but I think it tends to show up, as you note, more in distain for the foundations of this country than for hatred of any of the Conservatives on this blog. IMO, that sets him aside from that vast majority of Leftist trolls that have polluted this site over the years. No offense to Rusty, but Try isn’t all that far from where Rusty was a year ago. “…more in distain for the foundations of this country than for hatred of any of the Conservatives on this blog….” Well, he’s been pretty hostile to Cluster and me. True, he’s been kinder to you…. “… from everything I’ve read, was to accommodate slave states, not to award them “extra influence.”…” But was this “accommodation” of slave states intended to be an accommodation of slavery itself, or merely an accommodation of a situation which was created at least in part because the state was a slave state? After all, a law which accommodates the needs of people in wheelchairs is hardly an endorsement of the inability to walk. It merely acknowledges that this is a condition and proceeds to legislate to try to create some equality of access for those people. It does not address why these people are in wheelchairs, it doesn’t make value judgments on the ability to walk or lack of same. It merely acknowledges that this is a population that calls for a specific law to address its issues. In the real world we have to play the cards we’re dealt, and the cards on the table included some laws affecting how the populations of slave states were to be evaluated. The Founders had to work with and around those laws, and to come back more than 200 years later and say their efforts and their solutions were in any way approval of slavery, or an endorsement of slavery, or in any way related to slavery itself instead of to the way a state under these laws could achieve representation in the electoral process takes determination to twist facts to meet a preordained conclusion. In Try’s case, a malignant conclusion dictated by his pathology.